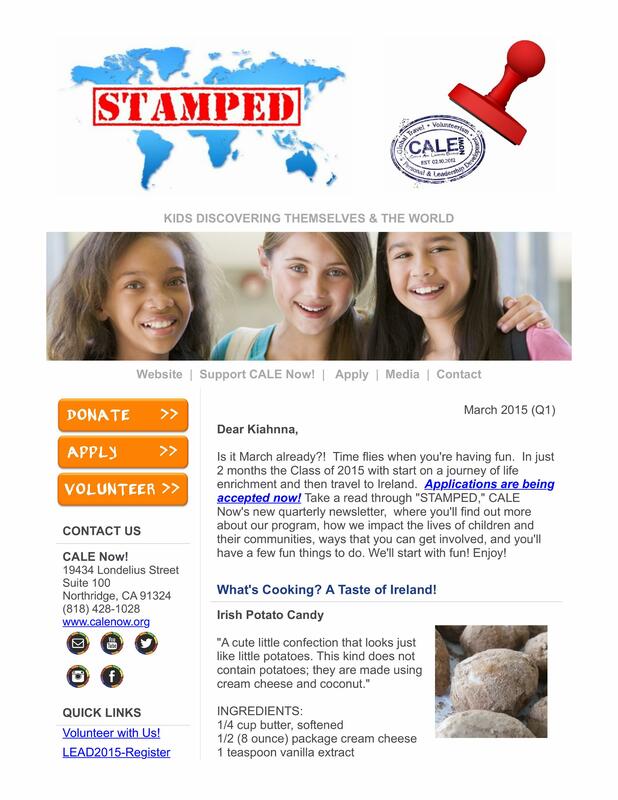 Start your application today to be chosen as a CALE Kid and earn a free summer program and trip to Ireland! Good luck! 2015 CALE Now! Applications Available Soon! Study abroad opens students’ eyes to new ways of thinking, instilling a more informed approach to problem-solving in cross-cultural contexts. 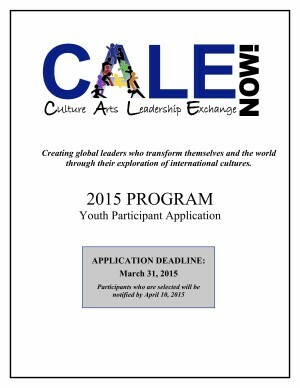 Starting this month, your child can apply to the 2015 CALE Now! summer program and international trip to Ireland. Scholarships are available to those with financial need. 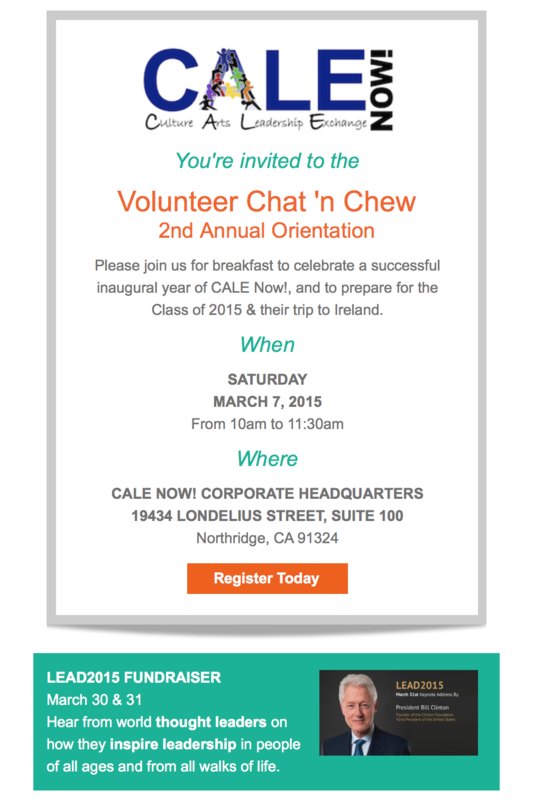 Visit www.calenow.org for more information and to get involved, & www.calenow.org/donate to support a child’s international education. International Education is Essential for the success of future generations! 2014 was a great year for CALE Now! Our CALE Kids contributed to the betterment of their community by volunteering, they developed finance skills and built character, and they traveled to Peru. What a great experience it was! Meet our 2014 CALE Kids! Norman Coulter of 6ixth Man Leadership will guide our kids through an interactive character building lesson on responsibility. Let the change begin! She was meant to be someone special. She was meant to impact lives on a global scale. She showed us grace, confidence, fearlessness, and the courage to move beyond what might be set to limit us. 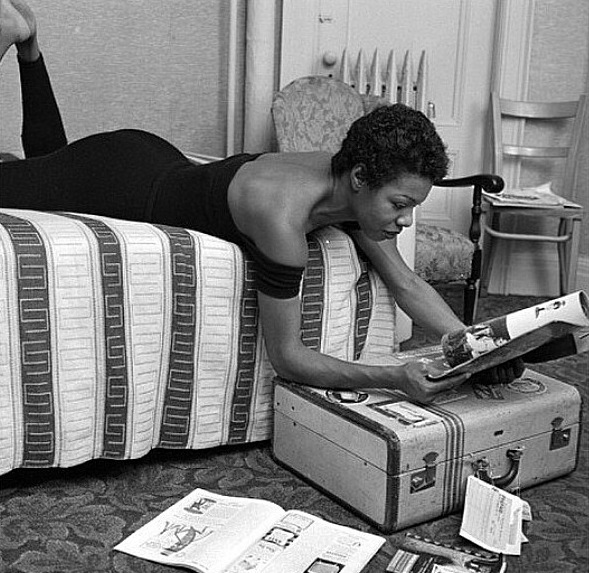 Maya Angelou was truly an inspiration to many people, young and old, and her legacy will live on. Today and always we celebrate the life of a phenomenal woman! The Best Quinoa We Ever Had! As we rose in elevation throughout the regions of Peru we saw the farm crops of quinoa on hills and mountainous ranges. While stopping at a local eatery we tasted the quinoa fresh from the region and fell in love with this grain. It was fresh, light and filling – it is one of those moments where you reconnect to the organic or the original purpose of an item and in this case it was the best quinoa we every had. 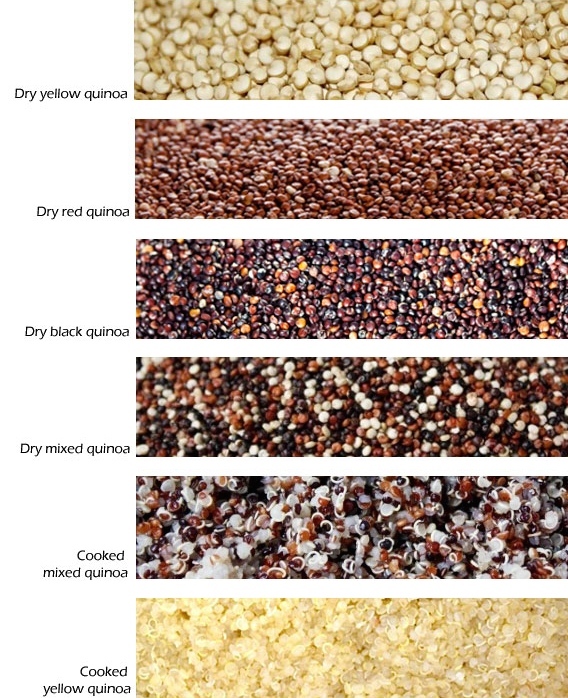 Quinoa has become increasingly popular all over the world, and a majority of the production takes place in Peru. 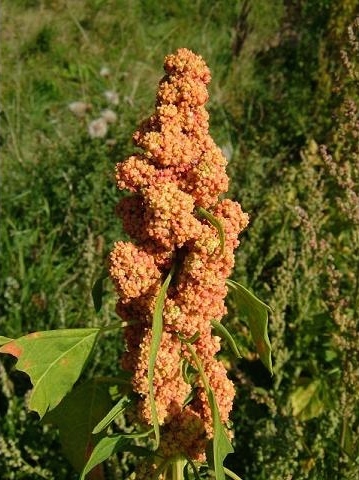 According to Wikipedia, the Andean people first domesticated quinoa around 3,000 years ago. Quinoa has been an important staple in the Andean cultures where the plant is indigenous, but relatively obscure in the rest of the world. The Incas, who held the crop to be sacred, referred to quinoa as chisaya mama or “mother of all grains,” and it was the Inca emperor who would traditionally sow the first seeds of the season using “golden implements.” During the Spanish conquest of South America, the Spanish colonists scorned quinoa as “food for Indians,” and even actively suppressed its cultivation, due to its status within indigenous religious ceremonies. In fact, the conquistadores forbade quinoa cultivation for a time and the Incas were forced to grow wheat instead. 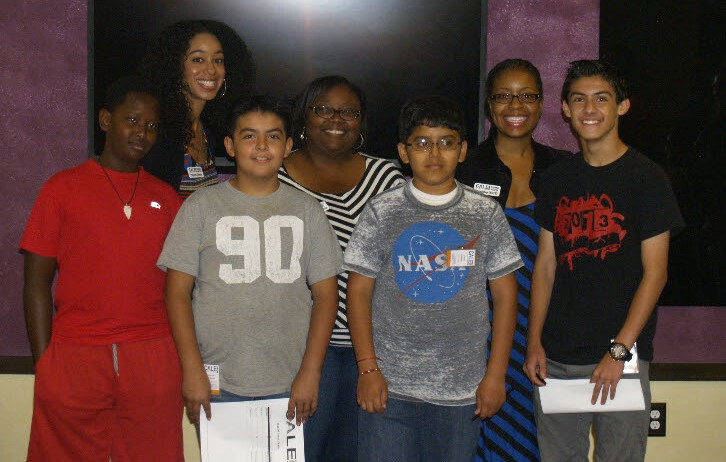 On April 5th we held our 1st Volunteer/Supporter Appreciation & Orientation. It was a tremendous success! We had a full house of CALE Now! supporters, volunteers, enthusiasts and potential participants. Supporters even called in from out of state and out of the country. The day was filled with information, inspiration and motivation. Our Founder and Cultural Exchange Officer (CEO), Kiahnna Patton, set the tone with direction and vision for the future of CALE Now! If you didn’t get an opportunity to sign up to volunteer, you can do so by completing an interest form on our website. 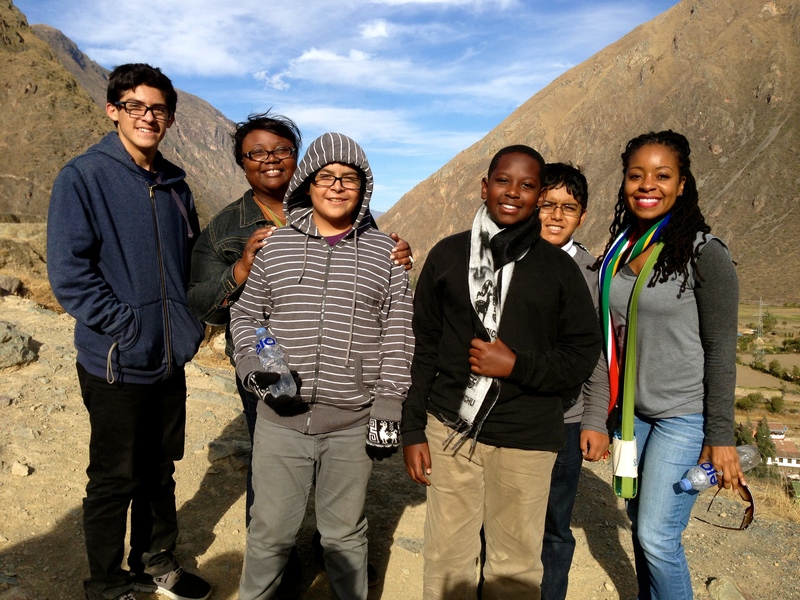 We will contact all of our volunteers shortly to start working on our 2014 program and trip to Peru, and to plan our 2015 program. There are many lives to impact and we appreciate your support! Please also share with your networks that Applications for the 2014 Program are available now. We encourage applicants with limited resources to apply, as financial support will be provided to all participants selected. Our guests were greeted at the registration table with their badges and everyone’s presence was an encouragement to us. Norman Coulter of 6ixth Man Leadership, one of our partners and major supporters, receiving his certificate after engaging our audience with a few words of encouragement. Thank you so much for making this day a success! We look forward to hearing from you and seeing you very soon. Our Founder and Co-Founder distributing certificates of appreciation to our volunteers and supporters who have worked tirelessly to create an amazing foundation. They’ve designed our website, reviewed curricula, edited documents, provided financial support, and more! Throughout the day there were many laughs and expressions of joy about the wonderful work ahead. 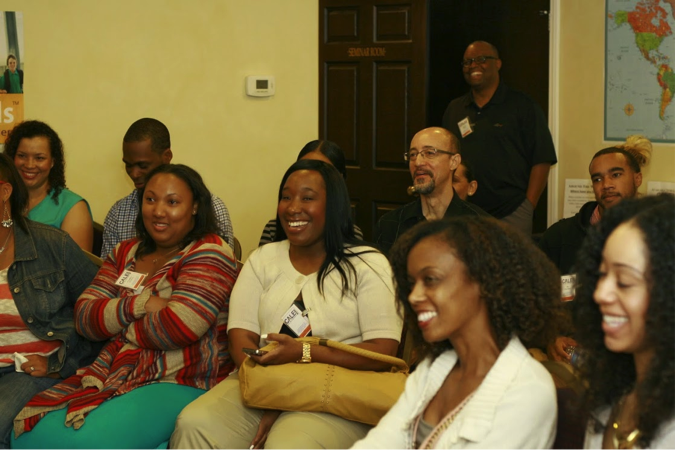 Here are some of our intently listening guests enjoying the information. We even had guests call in from TX, GA, and Italy! Many thanks to Khalisha Banks, Golden Butler, Christopher Lee, and Dominique Ralph for dialing in. During the mini break out sessions you can see our volunteers ready to engage. Session A covered areas that interact with youth participants, including International Chaperone, Expert Facilitator, Support Facilitator, Parent Liaison. Session B covered Fundraising, Administrative Support, Program Planning, and Technology. We heard your questions and responses, and are ready prepare our youth to explore the world in a meaningful way. Our Founders – AnGele Cade, Kiahnna Patton, Yahnese Griffin – ready to accomplish our mission to create global leaders who transform themselves and the world through their exploration of international cultures. The First Lady sat down for a CNN iReport interview to promote travel amongst young people. She took questions from viewers about traveling abroad. When asked what her first passport stamp was, Mrs. Obama revealed that it was from her first trip abroad to Paris, France. She elaborated, saying her sophomore class had the chance to spend a week in France, but she was afraid to ask her father to fund the trip, feeling like it was an extravagance.